It's March and that means "If He Only Had a Heart" is officially released into the world! Technically it came out yesterday but I decided to send this email today for one very special reason. A year a ago today (March 2), my amazing grandfather, Henry Smith Jennings, left this world. I wanted to dedicate this release to his memory. He was a brilliant internist with a focus cardiology in Gainesville, GA. He was also a major supporter of my theatrical endeavors in high school and LOVED our rendition of "Wizard of Oz." I think he would have really enjoyed this spin on the Tin Man's lament. Want to hear it for yourself? Feel free to listen on your favorite platform. Add it to playlists, leave reviews, share it with friends!! For the past month, my friends and I have been doing some fun gorilla marketing for the release as well. Thank you so much to all of you who have helped hang up the "Missing" signs in your areas. They made to to Washington, New York, Tennessee, Pennsylvania, Louisiana, North Carolina, Denmark, and even THAILAND to name just a few of the places. They are still going and if you want to take part in the fun, just send me an email and I will send you the jpeg for the posters and some free goodies for your good deeds! Thanks again to Roadtrip Nation for using my music for their latest episode "Setting Course." You can hear "Catch 22" and watch the entire episode HERE. I am incredibly honored to have scored the music for this amazing installation. These video shorts are incredibly powerful. If you have a chance, check out the piece and the rest of Jama's work. It is amazing. 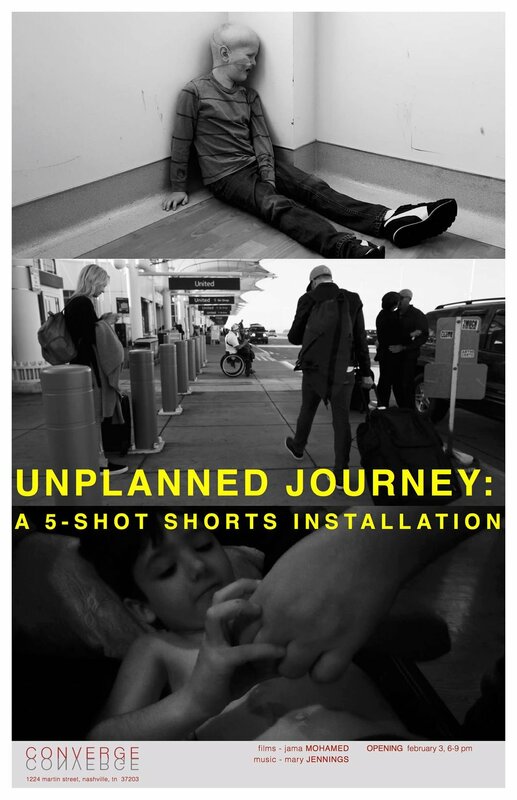 CONVERGE is pleased to present Unplanned Journey: A 5-Shot Shorts Installation, a collaborative film and music installation by Jama Mohamed, a local filmmaker exploring the topic of disability, and Mary Jennings, a local singer, songwriter, and musician. The event reception will be held on February 3rd, from 6:00 to 9:00 pm, at CONVERGE, 1224 Martin Street, in conjunction with Arts & Music at Wedgewood-Houston and is free and open to the public. For his first series of “Nashville 5-Shot Shorts” shown at CONVERGE in January, Jama Mohamed collaborated with the Family Voices of Tennessee on a unique project empowering families and individuals affected by lifelong special healthcare needs, chronic illness and/or disabilities to tell their stories through video. The project was inspired by Mohamed’s own experiences as parent to a child with disabilities. Mohamed visited participants in their homes and taught them the basics of creating video to assist them in depicting their own experiences with disability—simply using five short video shots. “Nashville 5-Shot Shorts” was a recipient of Thrive funding from the Metro Nashville Arts Commission last spring. For Unplanned Journey: A 5-Shot Shorts Installation, CONVERGE brought Mohamed and Jennings together to collaborate. Mohamed continued his work creating shorts with families from the Family Voices of Tennessee and the Family Advisory Council, and will show the black-and-white films simultaneously in a unified installation using tube televisions. The obsolete televisions underscore the marginalization that those with disabilities and special healthcare needs face. Jennings created music inspired by Mohamed’s work to enhance the installation with piano and ambient sound. Mary Jennings, a Casio-sponsored artist, was featured in an online advertising campaign for the company’s new line of keyboards in 2011. Her song “The Darkness” was placed in the Lionsgate motion picture “Devil Seed” and in 2014, her song “Move” was featured on Lifetime’s TV show “Dance Moms.” Mary has extensively toured, opening for artists such as Jeffrey Gaines, Mike Doughty, Teddy Geiger, Ryan Cabrera, and Rachel Yamagata, and has appeared at several major festivals including CMJ and South by Southwest. CONVERGE is a curated community of creative thinkers who collaborate on interdisciplinary projects that have a positive social impact, initiated by the husband and wife team, architectural designer Eric Malo and artist and poet Alysha Irisari Malo. 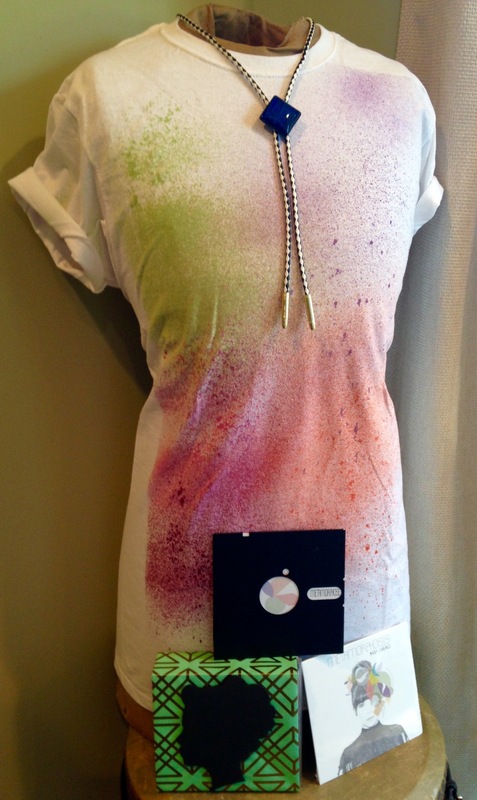 The group conceives and realizes project-based art and design, lifestyle, cultural, and community programming. Alysha Irisari Malo is the Project Manager of this CONVERGE project. I was heartbroken to hear about the loss of Dolores O'Riordan of The Cranberries. I was supposed to see her in concert last year but sadly she had to cancel due to complications with her back. Her voice and music shaped my adolescence and my songwriting. About two years ago, my dear friend, Ian O'Neill and I went into his studio to cover "Zombie" just for fun...just because we loved it. It seems like as good a time as any to share it with the world. I filmed a rare Nashville snow out of our upstairs window for the video. I hope you enjoy our rendition. It will never be Dolores, but I hope we can do her and The Cranberries justice during this tragic time. I have been so surprised and pleased with the support I have received from the WWE music supervisors. They keep using my music and I just love it. The used "One Brick" awhile back for their WWE 24 documentary series and they just used "Home" for one of their last WWE Monday Night RAW episodes of 2016. Thanks for the love WWE! 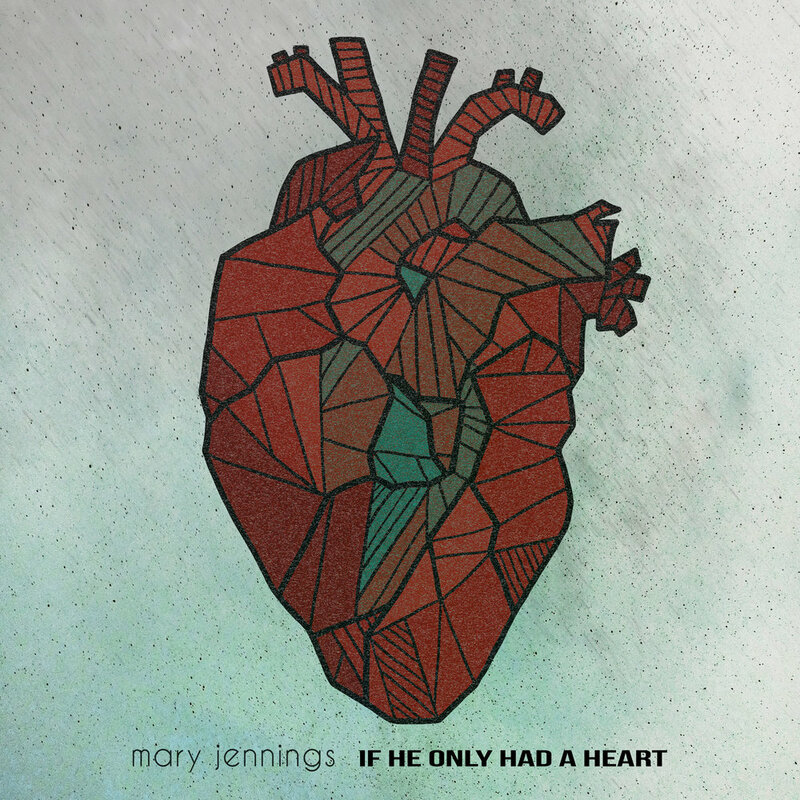 "Mary Jennings’ version incorporates vocals with piano and host of other instruments. All of them sound great, but none can overshadow Jennings’ own voice, which is on a whole different level." Thanks so much to Cultured Vultures for adding my rendition of "Everlong" in their "An Everlong for Everyone" post! So honored! I am so excited to announce that Roadtrip Nation Season 13 will be using some of my music from the Metamorphosis record! You can find "Metamorphosis" on episodes 1 and 4, "One Brick" and "Tectonic Plates" on episode 3, and "Tidal Waves" on episode 4. Roadtrip Nation airs on local public television and PBS stations but you can also watch it online HERE. Here is the final installment of the Live in Studio with Loop videos. In this video, I cover one of my favorite songs, "Elastic Heart" by Sia. It was produced by Ryan Youmans at Forty One Fifteen Studios in Nashville and was shot and edited by Joshua Mendez. Hope you enjoy! 2016 American Songwriting Award Nominee for "This Means War"
Thank you so much to the American Songwriting Awards for selecting "This Means War" as a nominee in your Performance category for 2016! It means a lot! Click here for list of awards. So stoked to have another licensing placement. I loved hearing "One Brick" off of my 2015 album "Metamorphosis" on one of the new "Major Crimes" trailers. Here is the 3rd installment of the Live in Studio Videos. It was shot at Forty-one Fifteen with Ryan Youmans as the producer/engineer and Josh Mendez as the videographer! This is an original from my 2015 release "Metamorphosis" called "This Means War." I had a great time talking with Ryan and Dave again on the Break the Business Podcast. We discussed the importance of copyrighting music and had some good laughs as well. I had a blast talking about songwriting, looping, marketing, collaborating and many other facets of the music business with Jesse Correll on The Hexagon. "This Means War" Top 5 in Great American Song Contest. Thank you so much to the Great American Song Contest for choosing "This Means War" as one of the top 5 winners in their adult contemporary category. Judges said “This Means War” has “powerful lyrical imagery, original theme and smartly devised melodic composition.” It truly means the world to me! I am so honored that "This Means War" was chosen as a semi-finalist in the International Songwriting Competition for 2015. It's amazing to be selected out of 18,500 songs! We'll see if I become a finalist! I am super stoked that Dance Moms decided to use yet another song in their show. Maddie Ziegler and the rest of the ALDC group danced "7 Deadly Sins" to "The Darkness" off of my 2011 record, Collapse, Collide. Hope you enjoy! I had a blast working on a series of live in studio looping videos. The engineering was done by Ryan Youmans at Forty-One Fifteen Studios in Nashville, TN and Josh Mendez rocked the video. The first release is "One Brick!" I had a great time talking withe James Taylor about songwriting, the music industry, and the gear I use on a regular basis. Hope you will enjoy listening as well. It's contest time again and we are using the release of "Metamorphose: Metamorphosis Remixes" as an excuse! With the release of this new material, we have seen how songs can change and evolve. Now, I want to see how YOU have metamorphosed over the years. In order to take part in this contest you simply have to do two tasks. 1. On your favorite social media (Twitter, Youtube, Facebook, Instagram), show me how YOU can metamorphose. Maybe it's a picture from your youth or a new haircut or outfit. Maybe it is something you've seen change like a pet or a house plant. Or maybe it is a song or a poem that you have worked on for years that is constantly changing. Just post about something you have seen metamorphose and tag me @jenningsmusic and add the hash tag #metamorphose. You can post as many times as you like which only strengthens your chance of winning. 2. Rate and review the new "Metamorphose: Metamorphosis Remixes" album on ITunes. Once you have done these two steps, you will be entered to win one of 5 PRIZES! Four runner-ups will receive a limited edition hard copy of the new remix album and a hand made "Metamorphose" t-shirt. The GRAND prize winner will receive a shirt, the limited edition album, and the rest of my albums in a fun care package filled with extra surprises. The contest winners will be announced on February 1st so get those posts in asap. Website by Press Management Group.